Monitor your Website and APIs from your Computer. Get Notified through Slack, E-mail when your server is down or response time is more than expected. Want to be notified of new releases in sanathp/statusok? Monitor your Website and APIs from your computer.Get notified through Slack or E-mail when your server is down or response time is more than expected. Simple Setup to monitor your website and recieve a notification to your Gmail when your website is down. Turn on access for your gmail https://www.google.com/settings/security/lesssecureapps . Thats it !!!! You will receive a mail when your website is down or response time is more. 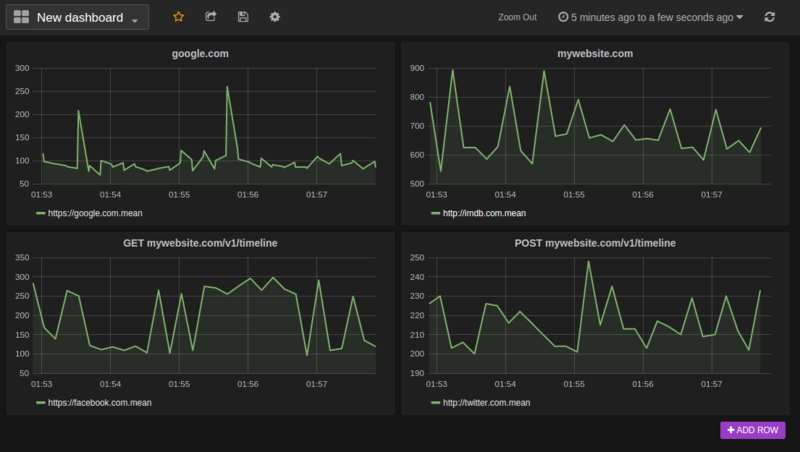 You can save data to influx db and view response times over a period of time as above using graphana. With StatusOk you can monitor all your REST APIs by adding api details to config file as below.A Notification will be triggered when you api is down or response time is more than expected. Save Requests response time information and error information to your database by adding database details to config file. Currently only Influxdb 0.9.3+ is supported. Contributions are welcomed and greatly appreciated. Create an issue if you find bugs. Send a pull request if you have written a new feature or fixed an issue .Please make sure to write test cases.